Andis Applewhite stopped by this summer to visit the AP/RC, talk, and drop off some artwork and related materials for her archive. In addition to six woodcuts and three trace monotypes, Applewhite left with the AP/RC some test sheets exploring colors, textures and shapes as well as several registration prints. She lives most of the year in Houston but also has a farm and studio in northern Texas where, among other things, she cultivates wine grapes. 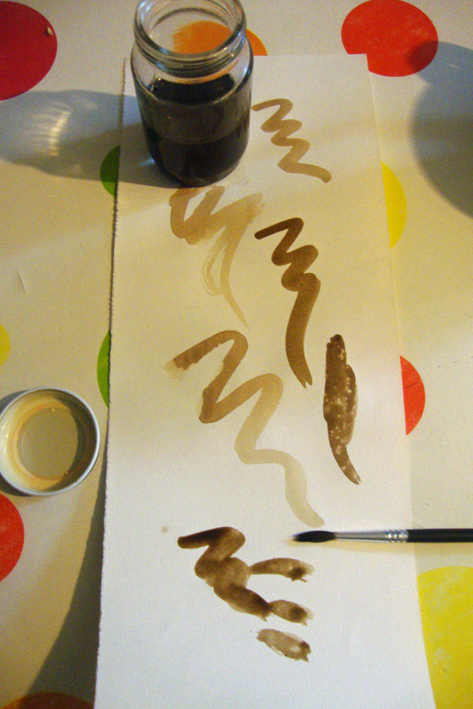 It’s been about a year since I wrote this post when I made a batch of walnut ink. I’ve been using it regularly and it’s delicious, silky, smooth and rich. It seems to be lightfast, no signs of fading on any of the pieces, although I’ve been careful to use best quality acid-free paper like Fabriano and Saunders. Here’s the most recent drawing, in carbon and white conte crayon overlaid onto a background of walnut ink. Terrific exhibition coming soon to Swansea Print Workshop – oooohhh!! !